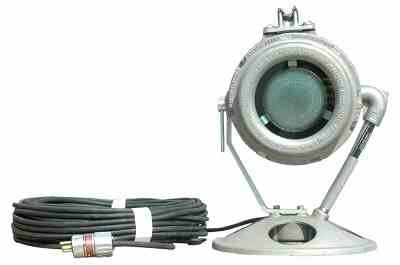 Explosion Proof Light - 250 Watt - 220V - Pedestal Mount - 100 foot Cord with Explosion Proof Plug. Made in the USA The EPL-PM-1X300-100-220V Explosion Proof Metal Halide Light is U.L. approved Class 1 Group D, and is rated for use in wet and marine environments. The waterproof construction and halogen lamp used with this unit provides operators with excellent power and economy coupled with high versatility and excellent durability. The EPL-PM-1X300-100-220V Pedestal Mounted Explosion Proof Light provides 3,000 square feet of work area coverage with 3030 lumens of light output. The 250 watt halogen lamp on this unit produces illumination in a wide flood pattern and provides an economical alternative to higher priced light sources. This portable unit is waterproof and tested to 500 hours of salt spray exposure in accordance with MIL-F-8115C Military Specifications. 40` container no illumination With the EPL-PM-1X300-100-220V This portable explosion proof light fixture is comprised of a 250 watt halogen light head mounted atop a circular pedestal base. The entire unit is fabricated from cast aluminum and is factory sealed and water tight. Class I Group D, T3C Rated, UL Standard: UL 1598, UL 844, UL Listed: E10794.